I initiated it, I did. "Come on, sit here. 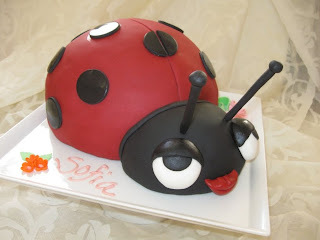 Let's look at pictures of ladybug cakes together." Oy. 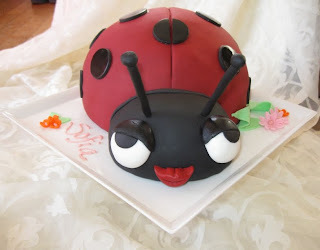 Not a can of worms, but page after page after page...after *page* of ladybug cakes thanks to Google Image and a six year old that thinks a long period of looking is fun. It was. It didn't end with one session. There were many requests for looking at cakes. We saw pink ladybugs, flat ladybug cakes, a green ladybug cake, orange ones, even a large white wedding cake with dozens of itty bitty sugar ladybugs cascading down one side. In the end, she picked the one she wanted, not the one I wanted. Have you ever seen a 46 year old pout? I used this cake opportunity to try out a new recipe from a new cookbook I received for Christmas. If you collect baking books, this is a good one. I varied the yellow cake recipe just slightly and lemon'd it up. Sofia's request ~ lemon with cream cheese frosting. Later, after the party, as the night was winding down, she asked, "May I please eat an eyeball?" Then it became a cake mutilation by two girls. Is this the new Sugar & Spice and everything nice? 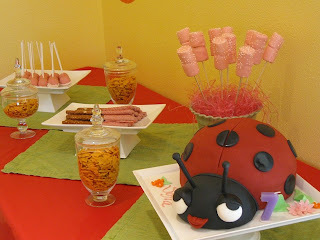 She was absolutely tickled...with the cake, with her party...with her turning seven years old. There is nothing like having children to know that the saying - How time flies - is so true. Love of children is absorbed instantly, given quickly...lasting forever. I love my babies like nothing else I've known ~ being their Mother makes me glow inside ~ as I know other mothers feel about their own...and can understand how vast the love.